X-Men fans who know the team from cartoons and movies are familiar with that single title acting as an umbrella to all of the various incarnations of the franchise. That’s about to change in 2018. Fans will get their first taste of a X-Men spinoff title with the release of New Mutants, a movie based on the third generation of young mutants at Xavier’s school who were spun off into their own title in 1984. Either that film or Deadpool will likely lead us to another movie named X-Force, which would show off a more-proactive, bloodier version of X-Men on film. Those spinoff titles – “new” and “force” – are explicit in describing what their teams represent. That’s one of many reasons why the film franchise is skipping over another X-Men spinoff title: X-Factor. We might eventually see an “X-Factor” movie or TV show thanks to a 2006 incarnation of the title, which envisioned it less as a team and more as the motley crew staffing a mutant detective agency. 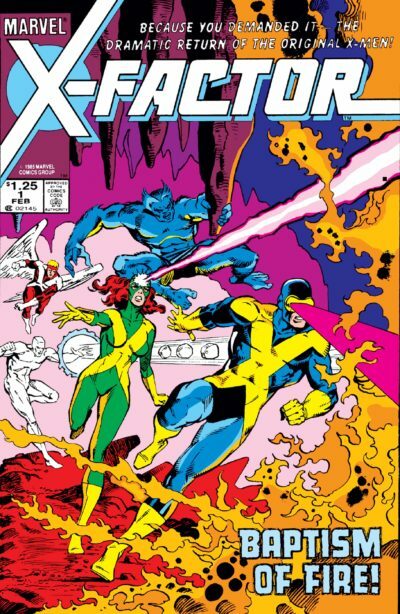 What we probably will never see is an adaptation of the original X-Factor, which was dedicated to reassembling the original comic book X-Men – Cyclops, Angel, Beast, Iceman, and Jean Grey returned from the dead. That’s because the film series has always been smart enough to realize that those five characters are a boring combination that’s quickly dominated by the Cyclops/Jean relationship. If the original X-Men are so boring, why were they reassembled? And, is it worth reading about over thirty years later? Those two questions are answered by the #31 vote on this year’s Marvel’s Most-Wanted Omnibus ballot. (Note that this post was published in November, as the originally scheduled post was interrupted by coordinating my move to my new home in New Zealand). Past Ranking: X-Factor was #13 last year, making it one of the biggest drops in rank in 2017. Probable Contents: Fantastic Four #286, Avengers #263, X-Factor #1 to 26 or 32, plus Annuals #1-3. Can you read it right now? Not entirely, and what you read will be in an hodge-podge of formats. The whole run isn’t even on Marvel Unlimited! Visit the X-Factor Guide for the full story. What’s in the X-Factor, Vol. 1 omnibus? X-Factor marked the first time the original five X-Men were reunited in over a decade. It was a clever solution to a non-existent problem, but also very nearly a dead-on-arrival dud. Even though it turned out to be good, I’m still convinced it was the first big misstep of the X-Men franchise. Marvel has made terrific use of their cosmic characters and settings in the past decade. Stories like Annihilation and War of Kings yielded the modern Guardians of the Galaxy team and returned Thanos to reality-threatening villain. They also cast the struggle of the Shi’ar, Kree, and Skrull societies as galaxy-spanning epic centuries in the making. Imagine the confusion of readers who loved those stories as they look for all of the vast history they imply deep within Marvel’s classic continuity and find … nothing. Well, not nothing. Thanos has lots of material, of course, via Jim Starlin. It’s just that those space-faring races had received their prior development in fits and starts, and in the background of other stories. We learned about the Shi’ar via The X-Men, and the infamous Kree/Skrull War was as much about the Avengers and Rick Jones as alien races. If this fruitless search describes you, then Silver Surfer by Steve Englehart is the cosmic comic you are looking for. 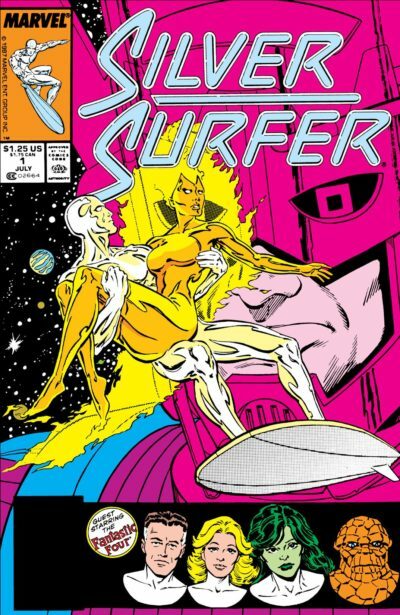 This was less a Surfer solo comic as a comic about all of Marvel’s vast galaxy of races and powerful entities – basically, everything that wasn’t Claremont’s Shi’ar or Starlin’s Warlock/Thanos territory. It’s lengthy, full of intrigue, and uninterrupted by crossovers and superheroes – and that’s why fans insist it must see omnibus collection even though half of it is already in an Epic Collection. (Note that this post was published quite a while after its post-date, as the original series was interrupted by coordinating my move to my new home in New Zealand). Silver Surfer by Steve Englehart (AKA, Vol. 1) is the #32 Most-Wanted Marvel Omnibus of 2017 on Tigereyes’s Secret Ballot. Visit the Marvel Masterworks Message Board to view the original posting of results by Tigereyes and collect all of these issue right now as detailed in my Guide to Silver Surfer. Probable Contents: This volume will definitely contain Marvel Fanfare #51 (a prologue story) and Silver Surfer (1987) #1-31 & Annuals 1-2. It would also likely mirror Silver Surfer Epic Collection, Vol. 3 by including the preceding Silver Surfer (1982) #1, Super-Villain Classics #1, and material from Epic Illustrated #1. If not exclusive to Englehart, this could could also include any or all of Silver Surfer (1987) #32-33, 38-39, & 41-43 to marry it to the Infinity Gauntlet omnibus. It might also contain material from West Coast Avengers Annual 2 and Avengers Annual 16, which tie strongly to this material, and an Al Milgrom short from Marvel Comics Presents (1988) #1. Creators: Written by Steve Englehart with Mike Higgins (#21), Mark Gruenwald (Annual 1), Renee “Ink” Witterstaetter (Annual 2), and Peter Sanderson (Serpent Crown backup in Annual 2 – likely not collected here). Pencils by Marshall Rogers (#1-10, 12, 21) and Ron Lim (#15-20, 22-31, Annuals 1-2) with Joe Staton (#11, 13-14). Inks by Joe Rubinstein (#1-12, 14-18, 20) and Tom Christopher (#20, 22-23, 25-30, Annual 2) with Dave Cockrum (#13 & 21), Jose Marzan Jr. (#14 & Annual 2), Keith Williams (#19, 31, Annual 2), Randy Emberlin (#24 & Annual 1). Colors by Marshall Rogers (#1-12) and Tom Vincent (#13-25, 27-31, & Annuals 1-2) with Gregory A. Wright (#26 & Annual 1). Letterers by John E. Workman Jr. (#1-7) and Ken Bruzenak (#8-22, 24-29, 31, Annuals 1-2) with Joe Albelo (#23) and Richard Starkings (#30). Marvel Fanfare with John Buscema pencils, Jack Abel inks, Christie Scheele colors, and Rick Parker letters. You can can pick up Silver Surfer Epic Collection, Vol. 3 – Freedom to read half of this (through #14), but then you’re out of luck.See the Silver Surfer Guide for more information. Worse, Marvel Unlimited doesn’t have any of this material as of this writing! Steve Englehart’s run on Silver Surfer is more than just a comic about one space-faring hero. It’s an intergalactic epic of multiple warring empires that will feel just right to modern fans who love stories like War of Kings and Game of Thrones. It was the first time Marvel’s cosmic characters had received such focus outside of a small cluster of 70s titles, mostly penned by Jim Starlin. Have you been anxiously waiting for me to tackle the top half of this year’s Most-Wanted Marvel Omnibus poll? Well, the wait is over. Now that I’m totally settled in New Zealand (along with my massive comics collection) I’m finally able to focus on completing this monstrous series if posts. I’ll be posting them with their originally scheduled dates from this spring. If you’ve been waiting for more of this series with bated breath, please consider chipping in to Crushing Krisis’s Patreon campaign. I don’t have the personal budget to keep CK alive with support from readers, and your contribution of even $1 a month accounts for about 1% of my hosting costs. I ron Man by Michelinie & Layton is tied as the #33 Most-Wanted Marvel Omnibus of 2017 on Tigereyes’s Secret Ballot. Visit the Marvel Masterworks Message Board to view the original posting of results by Tigereyes and collect all of these issue right now as detailed in my Guide to Iron Man. Probable Contents: Iron Man #215-250 and material from Annuals 9 and 10. Your eyes do not deceive you – this Iron Man run is actually not sequential to the Michelinie and Layton run that was already Omnibused ending with #157. Denny O’Neil writes the majority of the intervening issues before Michelinie and Layon return. The cover of issue #250 bears the Acts of Vengeance banner, but it doesn’t continue directly to the next two issues with the banner, so the omnibus can safely end there (although, Layton did return for #254 and 256, and the next Epic Collection begins on #257, suggesting this could continue through #256). Creators: Co-written by David Michelinie and Bob Layton, Sr. Co-writing and art (including colors) by Barry Windsor-Smith on #232. 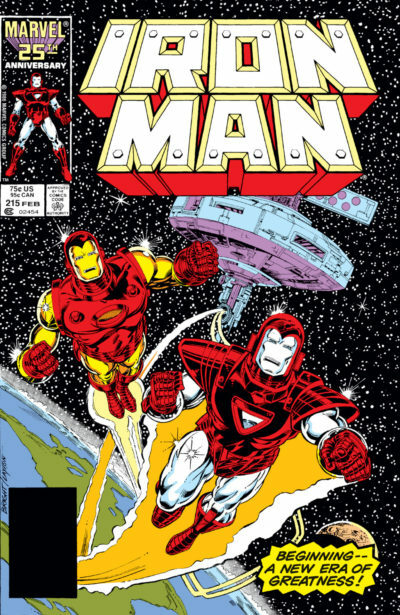 Bob Layton, Sr. provided a range of art through the run, from pencils to finishes to inks. Pencils and/or breakdowns were drawn by Mark “Doc” Bright through #231 and by Jackson ‘Butch’ Guice from #233 (with Denys Cowan on #241, Alan Kupperberg on #242, and Paul Smith on #245). Additional inks by Don Hudson (#239), Barry Windsor Smith (#243), Roy Richardson (#245), Herb Trimpe (#246), Tim Dzon (#247), and a massive team on #244. Colors by Bob Sharen (#215-243) and Paul Becton (#245-250) with Julianna Ferriter (#217), Nelson ‘Nel’ Yomtov (#226), and a team on #244. Letters by Janice Chiang (with Bill Oakley on #232). Can you read it right now? Mostly. Issues #215-232 & Annual 9 are collected in Iron Man Epic Collection: Stark Wars, but #233-248 remains an unreprinted gap. 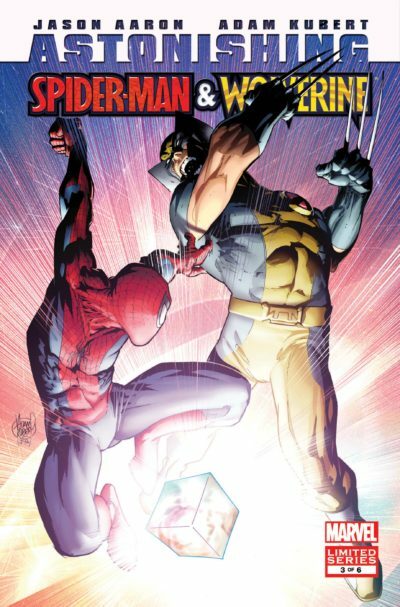 Plus, every single issue is on Marvel Unlimited! 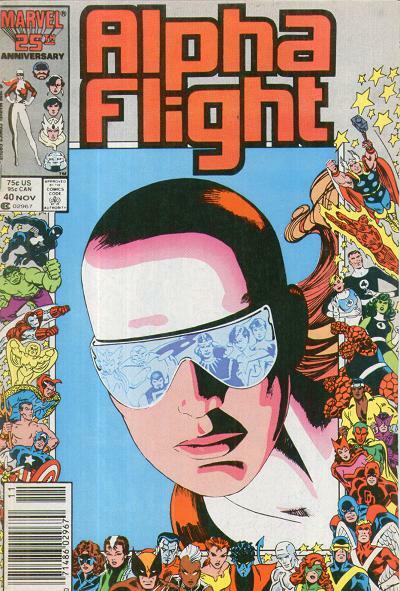 Alpha Flight is mostly known for its visually distinct team of founding members as written and drawn by creator John Byrne. With a Byrne Alpha Flight omnibus plucked straight from the 2016 survey results to be released earlier this year, is there any point in pushing for another collection of a less recognizable team? In any other case, the answer might be no, but the next run of Alpha Flight has its own remarkable pedigree – it’s written by Bill Mantlo with Jim Lee first ever sequential art for Marvel! Alpha Flight, Vol. 2 AKA by Mantlo, Ross, & Lee is the #32 Most-Wanted Marvel Omnibus of 2017 on Tigereyes’s Secret Ballot. 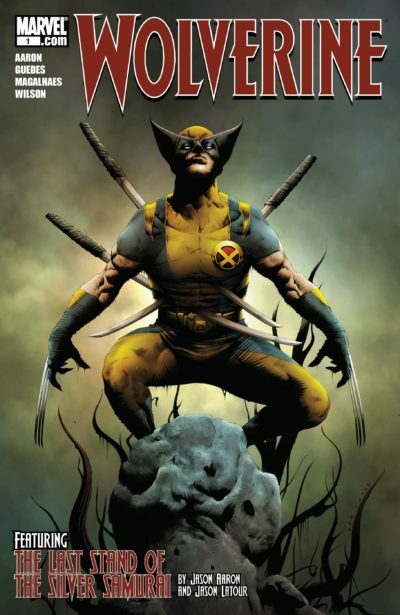 Visit the Marvel Masterworks Message Board to view the original posting of results by Tigereyes – plus, CK patrons have access to a super-detailed Alpha Flight reading and collecting guide that tracks not only every issue, but a complete reading order for each core team member’s every appearance. Probable Contents: Alpha Flight by Bill Mantlo, Dave Ross, & Jim Lee would collect at least Alpha Flight (1983) #30-66, Annuals 1-2, and Avengers #272 – marking a clean break on Mantlo’s run of the title before James Hudnall takes over with the “Wrath of the Dreamqueen” arc on #67. That said, it would make just as much sense for the omnibus to include Wrath of the Dreamqueen in #67-70, as it caps a few running plots. Then, it could push into Hudnall’s run as far as issue #78, which is another relatively clean break just prior to Acts of Vengeance. (Hudnall’s run continues through #86.) Then, one day Marvel could release a rather hefty final volume would cover #79-130, and maybe Northstar #1-4. Since running out the latter years of this relatively obscure team likely isn’t a priority for Marvel (who, after all, haven’t even reprinted this series past a trio of Classic trades from the John Byrne era), it seems much more likely they’ll go with the slimmer Mantlo / Ross / Lee volume. I still say it should end on #70, despite that ending on a bit of a cliffhanger. Creators: Written by Bill Mantlo through #66 and then by James Hudnall with pencils by Mike Mignola (#30-31 & 47), Jon Bogdanove (#32), Sal Buscema (#33-34), Dave Ross (#35-44), June Brigman (#45-46, 49-50, 52, & Annual 2), Jim Lee (#51, 53, 55-62, 64), Hugh Haynes (#54, 63, 65-67), and John Calimee (#68-76, 78 and beyond). Can you read it right now? Only in floppies! Otherwise, issue #39 is the sole collected issue in this run thanks to its crossover with The Avengers. It’s the same on Marvel Unlimited. Alpha Flight, Vol. 1 was previously a mainstay in the Secret Ballot top 10, but lo and behold we saw it printed in January of this year as Alpha Flight by John Byrne. Knowing the completionist urges of secret ballot voters, us wanting a volume two is fait accompli regardless of its quality – right? When fans are rabid for an aged property it’s sometimes hard to decipher if they’re interested in quality or nostalgia. Have you gone back to watch many of your favorite cartoons from when you were a kid? At least half of them won’t hold up. I think The Micronauts falls on the side of “quality,” and not just because of its Bill Mantlo pedigree. There’s hardly any residual fondness from sources other than the comic, since the toys were only a minor hit and there was not an ongoing cartoon or film for these characters. I’m not saying it’s Watchmen, but as comics about toys go, people aren’t voting for Micronauts just for nostalgic purposes. The Micronauts, Vol. 1 is the #35 Most-Wanted Marvel Omnibus of 2017 on Tigereyes’s Secret Ballot. Visit the Marvel Masterworks Message Board to view the original posting of results by Tigereyes. Probable Contents: The Micronauts (1979) #1 to 30, 35, 37, 44, or 46 & Annuals 1-2, plus bonus materials from reprint series The Micronauts: Special Edition (1983) #1-5. Then, a second volume would include the remainder of this series (through #59), The X-Men and The Micronauts (1984) #1-4 (after 57), and Micronauts: The New Voyages (1984) #1-20, written by Peter Gillis. Creators: Bill Mantlo writes this entire run – and, in fact, this entire series, save for the final issue. Issues #1-12 were drawn by Michael Golden with inkers Joe Rubinstein, Bob McLeod, & Al Milgrom, and colorists Carl Gafford, Doc Martin, & Roger Slifer. Afterwards, it’s line art primarily by Howard Chaykin and then Pat Broderick, inks by Al Milgrom, Armando Gil, Danny Bulanadi, & Doc Martin, and colors by Bob Sharen, Roger Slifer, & Barry Grossan. Can you read it right now? Sadly, you’ll need to hunt down some floppies to read this series. 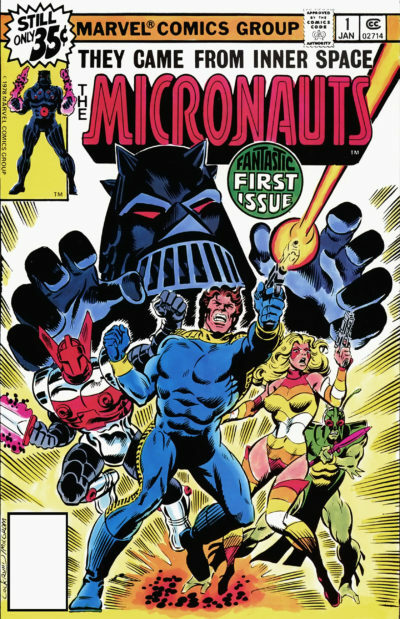 The Micronauts were one of many licensed properties that Marvel developed into ongoing comics in the 1970s. The comics were based on a line of Mego toys that were first released in 1976, which in turn were based on designs and concepts from Microman, a line of Japanese toys. If you’re a child of the 80s like me, you’re used to most major toy lines coming with a Saturday morning cartoon that was a combined story bible and toy commercial. Micronauts didn’t have that built-in media tie-in – the comics were it! That meant that writer Bill Mantlo was creating the Micronaut’s world and story from whole cloth with each issue – unlike Star Wars or Conan, which adapted other existing and implied stories.